(e.g. when to escalate a complaint). Think about who a teacher can complain to without it affecting their work. Or how important a worker is in the decision making process. (e.g. signing of letters, payment authorization). Think about who has the right to sign school letters, make decisions, have access to money and student information. Managers working in these departments are called line managers. They have the authority to give orders and to have their decisions put into effect in their department. They directly supervise subordinates in a clear line of authority. When the chain of command is short, the organization will have 'wider' spans of control. There is no perfect organizational structure. 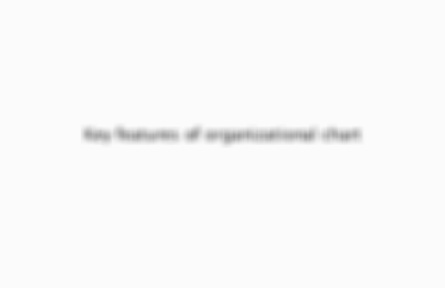 In recent years many organizations have made their structures 'wider' and with a shorter chain of command. In some cases this has been done by removing a whole level of management- called de-layering. There are other departments which do not have a specific function and which employ specialists in particular areas. Examples from a supermarket might include the Economic Forecasting department and the IT department. Data protection: may include regular backups, restricted access, deleting information after use, not asking excessive questions not related to the data gathering process. The line in the sand drawn by individuals that restrict them from using other people's work for their own purposes. This is ambiguous but can be effective if working in conjunction with a code of practise. When we personally book something we verify it before proceeding but within companies there are additional risks such as double bookings, cancellations, timings of meetings, international issues like time zones or religious days, public holidays. This depends on the nature of the document and the value and urgency of the information. Time, money and inconvenience are straightforward but also reputation, expectation and dependence. Protects the rights of staff against discrimination because of their beliefs, gender, age, ability, race, size etc. Varies from job to job but consider what a teacher is expected to wear.